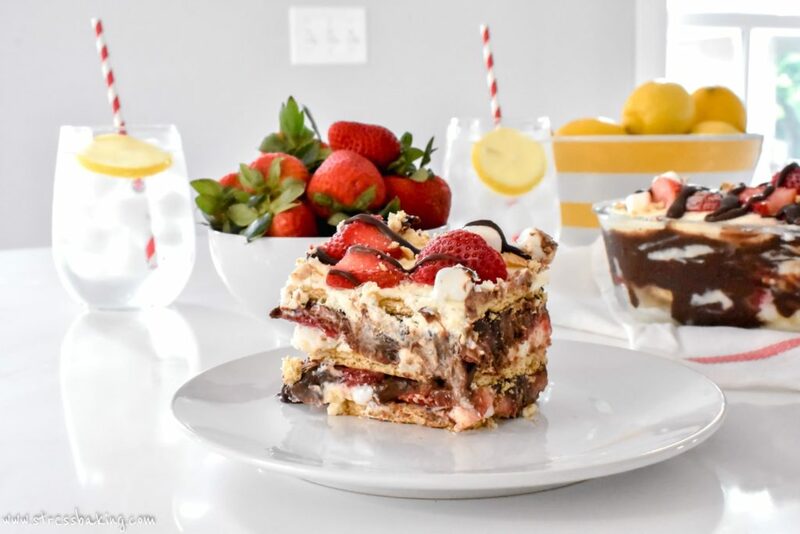 Easy to make no bake cake with three layers of whipped cream, marshmallows and Fluff, graham crackers, sweet strawberries, and rich chocolate ganache. 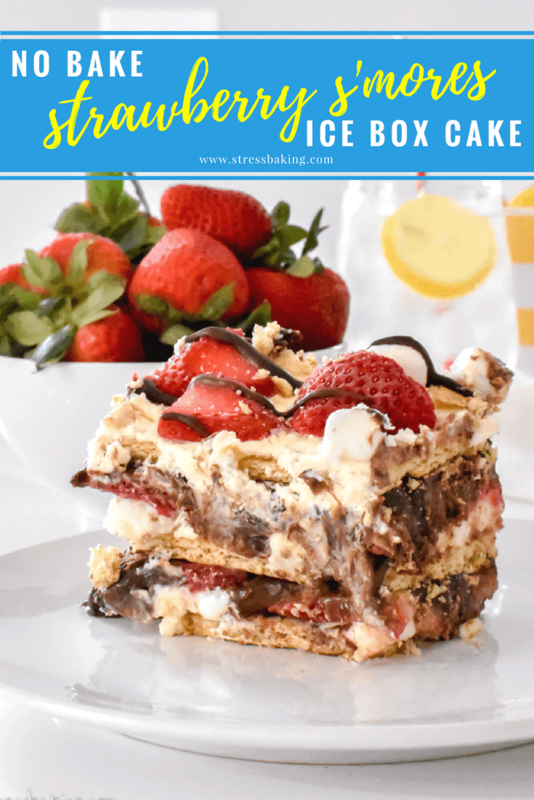 Perfect to make ahead for a summer party – and you can even swap homemade whipped cream for Cool Whip to make it even quicker! K, so… this cake. I gave you guys a sneak peek at it on my Instagram Stories a couple weeks ago, and I got flooded with messages from people about how they wanted to eat their phone and pretend it was the cake (don’t do that) and begging for the recipe. At last, you no longer have to consider the option of your phone as a food source because the recipe has arrived! ? Let’s talk about all the good stuff that goes into this bad boy. And by good stuff, I do not mean healthy stuff. Just want to make sure I’m totally clear there. 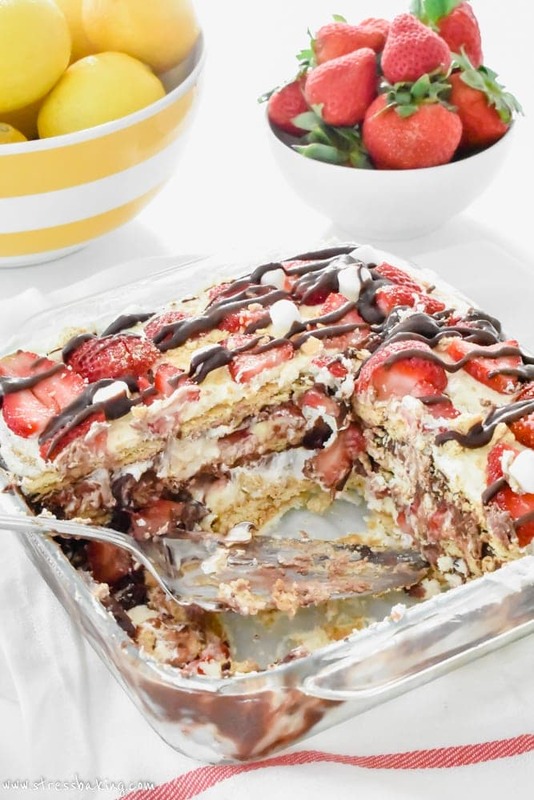 This is a luscious, rich dessert that is loaded with all sorts of things the doctor would tell you to stay the hell away from, and that’s what makes it so great. 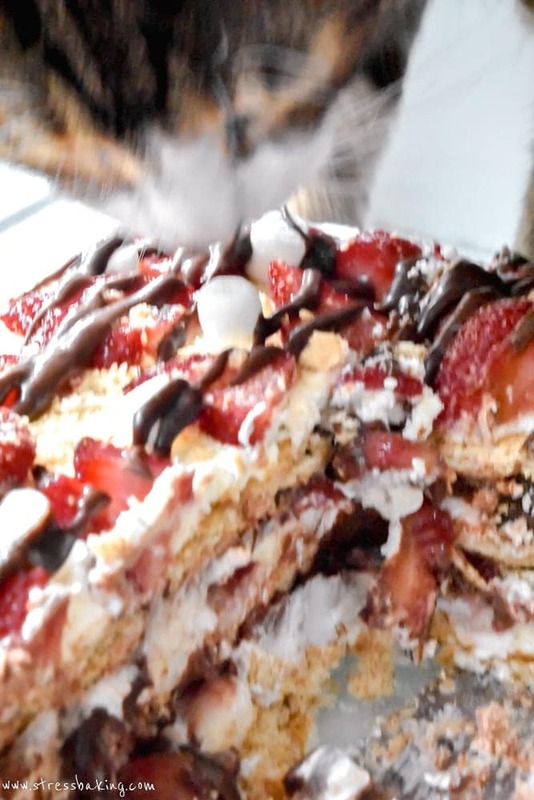 Well, he’d probably be okay with the strawberries, but we’re going to sandwich them between whipped cream, marshmallow fluff, chocolate and graham crackers, so… he’s probably out on this one. In a surprise to absolutely no one, I used my favorite mascarpone whipped cream as the base for the marshmallow Fluff layer. While I highly recommend it, you can feel free to use a premade whipped cream or Cool Whip to save yourself a few minutes and/or ingredients. You’re going to add Fluff and mini marshmallows to the mix, for a thick and fluffy filling. And the best part about this recipe is that it’s easy. Like, have your kids make it for with you kind of easy. The only thing that needs a heating element is making the chocolate ganache where you need to warm the cream that’s going to get poured over the chocolate, so maybe keep that step for yourself and delegate the rest to the little ragamuffins. The fun part is putting it all together! Quite frankly you don’t even have to do the layers in the order I outline in the recipe, so go nuts. Just know that all this will get just over the top of an 8×8 baking dish, so don’t get doubling up on any of the ingredients and you’ll have a big ol’ mess on your hands. As much as you may want to dig in as soon as you’re done constructing it, you need to wait. I promise it’s worth it. It needs to go in the fridge for a good four hours so that it can all meld together and get the graham crackers all soft and full of flavor. 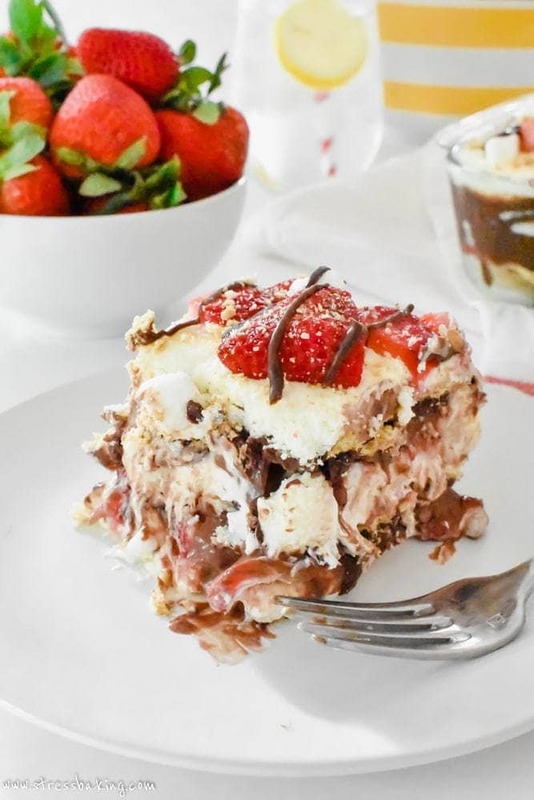 And the chocolate combined with the strawberries is to die for. Chocolate covered strawberries are a thing for a reason, my friends. Full disclosure: I did not let it set four hours before I took these pictures because I was running out of daylight and planned to bring it to work with me the next morning. So you’re seeing it a little less soft than it would be in reality. It’s likely that you’re not going to get perfectly cut pieces of this cake – it can be a mess, and you just need to embrace it. It’s so delicious it’s not going to matter, so if you have to just scoop it out and dump it in a bowl. This is a time I’m going to emphasize that looks don’t matter. So if yours is a hot mess, let it be a hot mess. 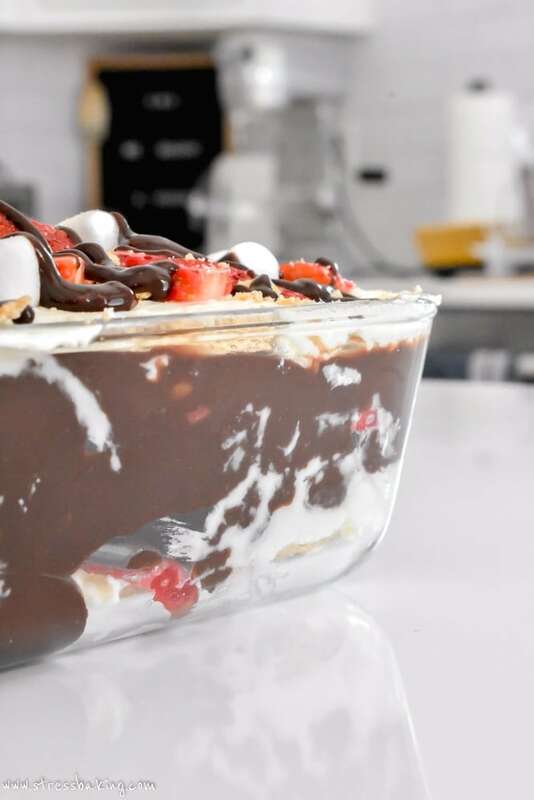 This is the perfect dessert to make ahead of time and bring to a summer party, because you have to let it set in the fridge for it to become the glorious wonder that it is. Or you can make it on a Monday night to bring to work on a Tuesday. There are no rules here. This is a rule-free zone. Now go make this and watch yourself become everyone’s new favorite person. Chill a large mixing bowl in the fridge – you’ll need this for the whipped cream. If you’re not going to make your own whipped cream and would prefer to use premade or Cool Whip, you can skip this step. 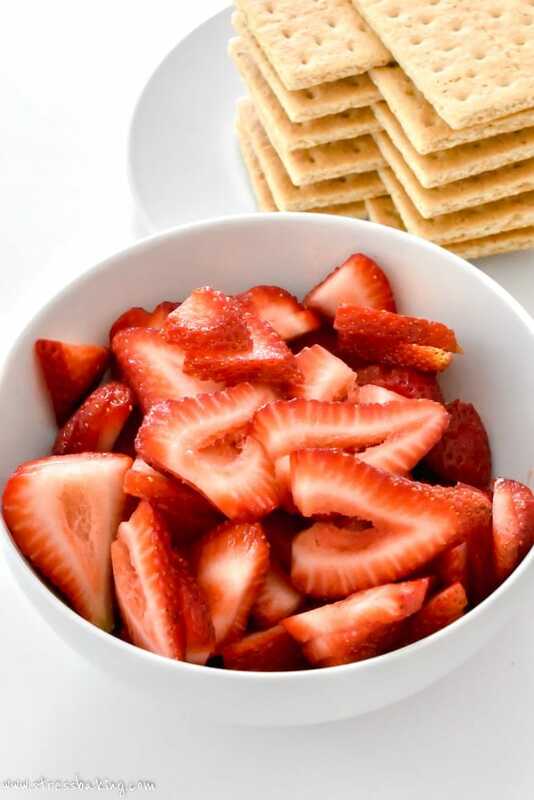 Remove stems from the strawberries and slice. Pro tip: if you have an egg slicer, use it to slice the strawberries and speed up the process! In a small saucepan, warm the heavy cream over low heat until it comes to a simmer. 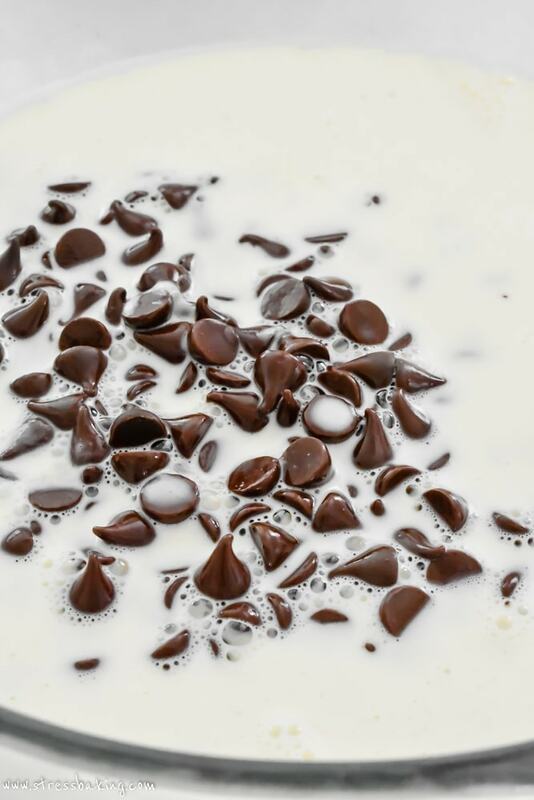 Immediately pour the cream over the chocolate, and let it sit for a few minutes. Stir until melted, combined and smooth. Place the chocolate in the fridge while you prep the rest. Note: If you’re not going to make your own whipped cream and would prefer to use premade or Cool Whip, you can skip this step. Add vanilla and heavy cream, and mix on a low setting until it is mostly combined. Now increase speed to high and whip until stiff peaks form. Set aside. 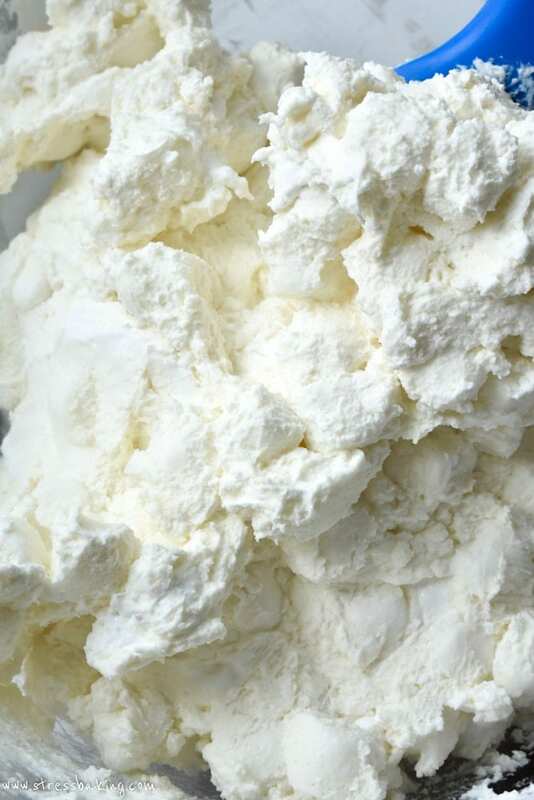 In a large bowl, add 2/3 of the prepared whipped cream (or Cool Whip, if using), Fluff and mini marshmallows. Use a spoon or spatula to stir to combine. In an 8×8 pan, spread a thin layer of the marshmallow mixture on the bottom of the pan. You just want enough for the next layer of graham crackers to stick. Line the bottom of the pan with a single layer of graham crackers, breaking them as needed to cover everything. Use a spatula to spread 1/2 of the remaining marshmallow mixture on top. Pour half of the chocolate ganache on top, using a spatula to smooth it out. Now start over! 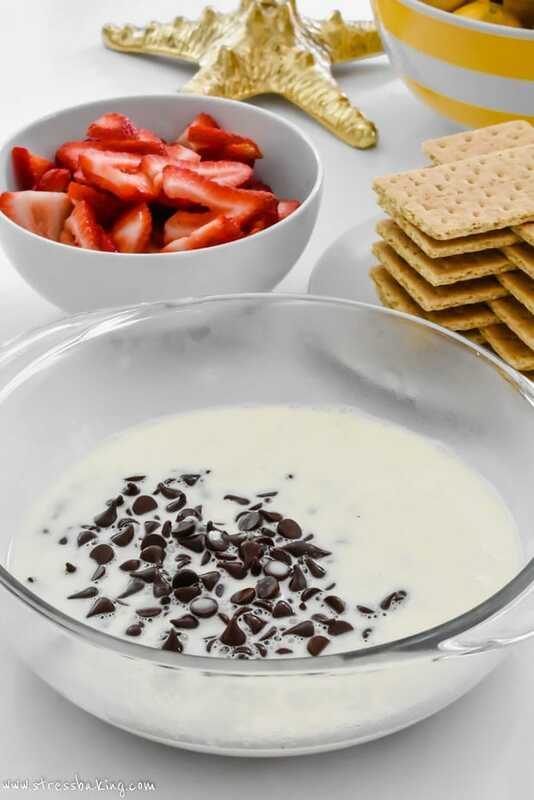 Add another layer of graham crackers, the other half of the marshmallow mixture, then another layer of strawberries, and top with the remaining chocolate ganache. Top with one more layer of graham crackers and cover with the reserved 1/3 of your whipped cream and the remaining strawberries. 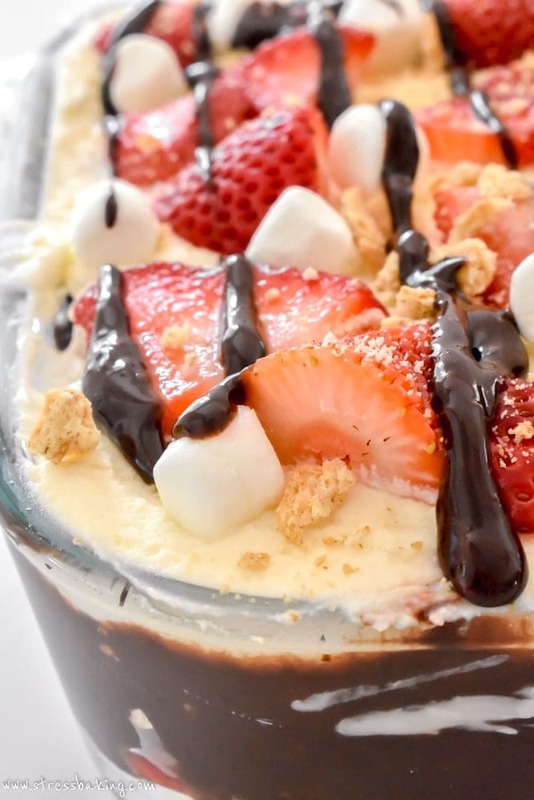 Optional, but strongly encouraged: Add a handful of mini marshmallows, crushed graham crackers and a hearty drizzle of melted chocolate to top it all off! Place in the fridge for at least four hours to let it all meld together. Slice into 9 pieces, serve and enjoy! I can see why people would want to eat their phones lol This looks like all sorts of deliciousness… seriously sometimes the good stuff needs to be the stuff that the dr says heck no too! I LOVE all things s’mores!! Why have I never thought to put strawberries on mine? Can’t wait to make these! You and my best friend would get along so well, because so does she (to a fault haha)! 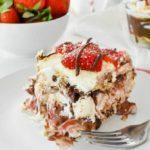 I love all of those ripe strawberries layered in this. What a great dessert for summer! I’m sorry but I’m going to need your address so I can send you the bill for my laptop. You see, I was drooling so much so much all over the keys that it short-circuited and blew up. It was quite pitiful because I didn’t get the chance to print out the recipe. My gosh!! That is one dessert to die for!! Buttery crackers in a layered dessert? How have I never thought of this? It’s brilliant and looks so yummy! 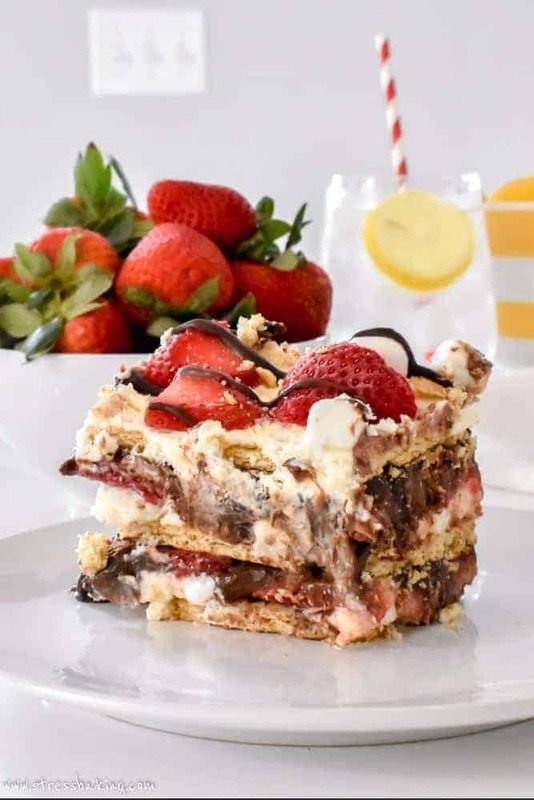 Looking at this recipe I was thinking, hmmm….marscapone from tiramisu, strawberries from strawberry shortcake, graham crackers and marshmallow from s’mores, chocolate and whipped cream from everything I love. This is the perfect dessert! You’re killing me girl. This looks SO good. I love that it does not involve turning on the oven too, because this apartment gets to be 1000 degrees in like 3 minutes. Strawberries are my obsession right now, looking forward to a reason to make this! Okay, you’re being ridiculous and exaggerating. It only gets to be, like, 999 degrees. COME ON, LAUREN. 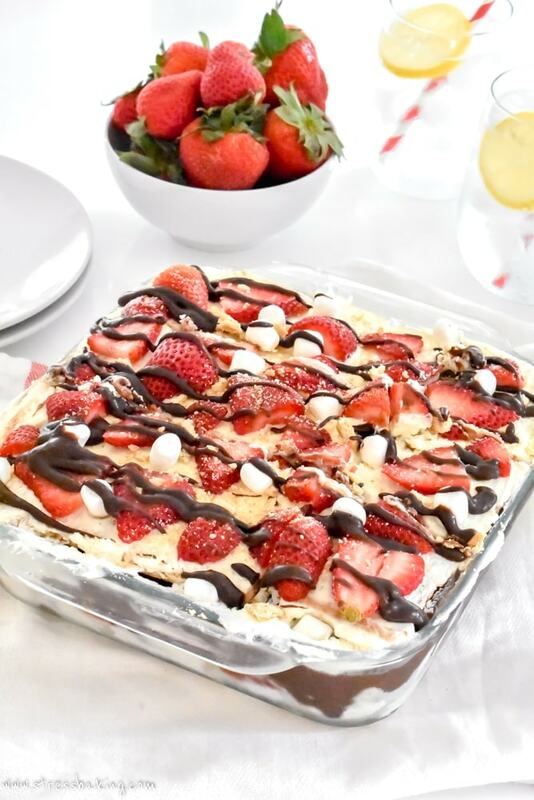 I kind of have a minor obsession with all things s’mores (I just made a big pan of s’mores bars last night, and have s’mores pie on the brain for later today…) but I’ve never tried adding STRAWBERRIES to s’mores! Can’t wait to give this a try! Your “minor obsession” is me on a non-obsessed day, haha! Oh WOW! 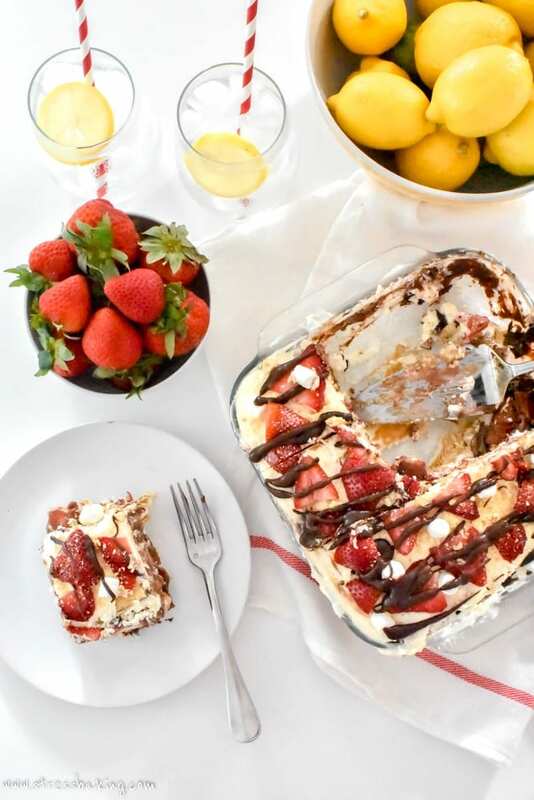 What a perfect, showstopper, everyone-will-ask-for-the-recipe summertime dessert! A great balance between being so decadent, and yet also cool and refreshing for a hot day! And seriously – that little photobombing kitty head – so cute I can’t stand it! I was just wondering what in the world I was going to do with all of the strawberries that I bought from a local farm yesterday. No I have my answer! This looks so yummy and pretty easy to make too. Maybe I’ll get the kids to help me put it together! Oh deary me, this is everything I love all at one time! I know my kids would enjoy this so much, I can’t wait to try! This looks so good it’s unreal! Now excuse me while I run down to the store because I need this in my life NOW. looks amazing! 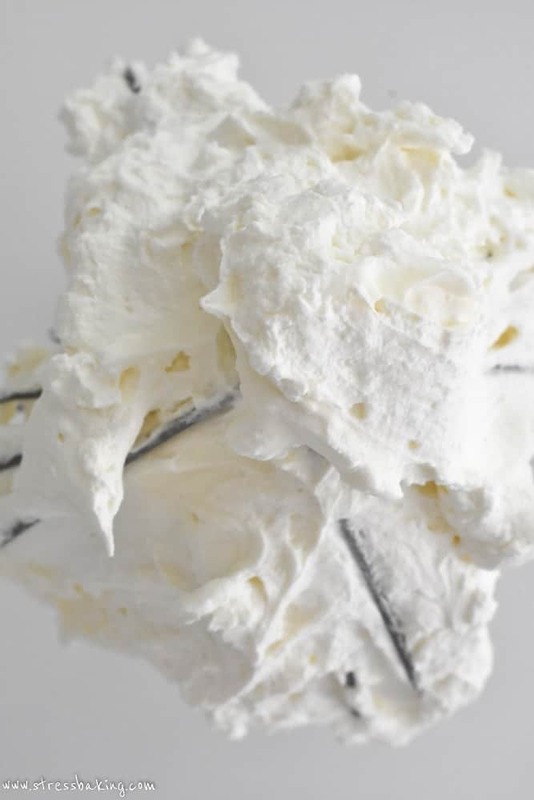 A few years back I was looking for a stabilized whipped cream idea and sure could have used the one that was linked here….I also pinned that one for later!